The forex trading week has come and gone. Time to take a look at what was driving forex price action. Were you able to profit from any of this week’s top movers? Half of the top 10 movers of the week are Kiwi pairs, with the Kiwi showing weakness in all of ‘em. The main theme this week therefore appears to be Kiwi weakness. Aside from that, we also have Greenback strength as a major theme. So, what was driving forex price action on these and the other currencies? The Greenback was the one currency to rule them all this week. And Greenback bulls can thank the U.S. Fed for that. As y’all can see in the chart above, the Greenback was range-bound while slightly trading lower ahead of the last FOMC statement of the year. And when the Fed finally announced its monetary policy decision, the Greenback spiked higher across the board. What happened? Forex Gump already has the most important details, so read his write-up here, if you’re interested. The gist of it all, though, is that the Fed finally hiked after an entire year. The rate hike itself was not a surprise, but the Fed’s upbeat outlook on the labor market and growth, and more importantly, the Fed’s upgraded rate hike projections were not expected. The Fed now projects 2-3 25 bps rate hikes in 2017, which is more than the 1-2 rate hikes projected during the September FOMC statement. Furthermore, the Q&A portion of the presser reveals that some Fed officials upgraded their rate hike projections because of the expected fiscal stimulus under Trump. Yellen didn’t appear to be one of these Fed officials. But when she was questioned on whether more fiscal stimulus could lead to an overheating of the U.S. economy, Yellen answered that she believes that fiscal stimulus is not needed at this point. The implication here is that the unwanted fiscal stimulus could lead to an overheating of the economy, which may then force the Fed to hike faster as a response. And so far, only “Some of the participants, but not all of the participants” have considered this scenario, so the Fed could potentially hike faster than projected. This assumes that Trump pushes through with his fiscal stimulus of course. In summary, the upbeat economic outlook, the extra rate hike in 2017, and hints at the possibility of hiking at an even faster rate than projected fueled demand for the Greenback across the board. After that, the Greenback then kinda traded sideways on Friday, with diverging price action near the end. Makes you wonder if the Greenback’s strength will persist next week, huh? The higher-yielding Kiwi had a good run from Monday to most of Wednesday, thanks to the prevalence of risk appetite during the week. However, it got clobbered really hard during the FOMC statement and everything was just downhill from there. What’s up with that, yo? There were no apparent catalysts and market analysts aren’t really talking about the Kiwi’s weakness much. However, it is highly likely that we’re seeing U.S. dollar dynamics in play again. This “narrowing of interest rate differentials“ mostly means a Fed rate hike, with the rationale being that a Fed rate hike (or hikes) would pull investors away from New Zealand while enticing more investors to go to the U.S., causing NZD/USD to tank, which would then pull down the other Kiwi pairs. Those four points were originally applied to the Kiwi’s positive reaction to the NFP report, but they are even more relevant to the FOMC statement. You see, the search for higher yet relatively safe yield in a low-yield world has resulted in higher demand for the higher-yielding Kiwi (much to the RBNZ’s frustration and dismay). But with the upbeat U.S. economic outlook, the Fed’s December rate hike, as well as projected future rate hikes, bullish pressure on the Kiwi is now expected to ease as investors pull out of New Zealand and the Kiwi in favor of the U.S. and the Greenback. Oh, make sure to keep an eye on the yen, since the BOJ statement is coming up next week. The Aussie had a rather mixed performance from Monday to Thursday, but weakened across the board on Friday. There was no clear catalyst, but it’s highly likely that the Aussie got pulled down by the 2% drop in iron ore prices on Friday, which market analysts blamed on lower demand from Chinese steel mills. There’s also at least one market analyst who attributed the Aussie’s Friday slide to unwinding and/or speculation ahead of today’s annual Central Economic Work Conference in China. Other than those, it’s also probable that the Fed’s decision to hike rates while communicating more rate hikes in the future also sapped demand for the Aussie in favor of the Greenback. After all, the Aussie is also a higher-yielder like the Kiwi and the Aussie has also benefited from the search for higher yield. Moreover, “Trading of Australian dollars on the foreign exchange market is, like most other currencies, predominantly against the US dollar,” according to the RBA itself. The narrower interest rate differentials due to the Fed’s rate hike, and expectations of even narrower differentials in the future therefore helped to push AUD/USD lower, which then weighed down on all Aussie pairs. It just so happens that unlike the Kiwi, Aussie pairs were able to put up more of a fight, until the drop in iron prices on Friday finally made Aussie bulls call it quits. The pound was the second weakest currency last week, but it recovered and ended up as the second strongest currency this week. Looking at the chart above, we can see that the pound first got broadly bid up during Monday’s morning London session. But as I noted in my London session recap, there were no apparent catalysts, although some market analysts were attributing the pound’s rise at the time to preemptive positioning ahead of the top-tier events for the week. The pound’s strength was then sustained during Monday’s U.S. session, as well as Tuesday’s Asian session, thanks to U.K. Finance Minister Philip Hammond’s rhetoric supportive of a transition period to soften the impact of the actual Brexit process. The pound then got another bullish boost during Tuesday’s morning London session, apparently as a reaction to the U.K.’s November CPI coming in at +1.2% year-on-year, which is better-than-expected and the best reading since October 2014 to boot. However, the pound began sliding across the board when the U.S. session rolled around. There were no catalysts, but some market analysts say that it was likely due to unwinding ahead of the FOMC and BOE statements. After that, the pound then behaved itself before getting bid up again during Wednesday’s U.S. session, but ahead of the FOMC statement. Market analysts attributed this to further easing of Brexit-related jitters, thanks to top Brexit Negotiator David Davis’ speech before Parliament that he would support a transitional deal “If it is necessary and only if it is necessary.” In the same speech, Davis also revealed that Theresa May’s government is working on plans for four possible outcomes, but such plans won’t be out until February next year. Getting back on track, Davis’ rhetoric apparently allowed the pound to soldier on after that, although GBP/USD got whupped, thanks to the FOMC statement and the resulting Greenback strength. Pound pairs finally retreated across the board come Thursday, though, thanks to the BOE statement. Forex Gump also has a write-up on the BOE statement, and you can read it here, if you’re interested. The main takeaway, however, is that the BOE is maintaining its neutral policy bias, but the chance that the BOE would switch to a hiking bias is now lower because of two main reasons. To simplify, investors seem wary of investing in the U.K. due to the Brexit hubbub. Fewer investments mean slower GDP growth in 2017 and hiking rates when GDP growth is expected to slow down is not really a smart thing to do. Plus, the pound’s recent recovery after the Brexit-induced slump means less inflation overshoot, which is yet another reason against hiking rates. Given the above two reasons and the corresponding lower probability of a switch to a hiking bias, it’s no real wonder why the pound tanked as a result of the BOE statement. After that, the pound continued sinking lower and then began trading sideways before getting bid up again during Friday’s U.S. session. There was no clear reason for the pound’s broad-based recovery on Friday, though. Oil benchmarks were able to close out the week with some decent gains as you can see below. However, the Loonie had a mixed performance, but with more losses than wins this week. What’s up with that? If y’all can still remember, I told y’all last week to keep an eye on how the Vienna meeting with non-OPEC members will unfold, since that will likely affect oil’s (and the Loonie’s ) price action. Well, that meeting turned out to be a success, which caused oil to surge rather hard. However, Loonie pairs weren’t following suit, although the Loonie did get a moderate boost across the board. There was no clear reason for this reluctance to track oil prices. And most unfortunately for Loonie bulls, many Loonie pairs DID follow suit when oil prices began retreating after the International Energy Agency said that OPEC probably produced 34.2 million barrels per day in November, which is 500,000 more than OPEC’s own estimates. Oil did manage to recover on Friday, though, thanks to higher 2017 oil forecasts from Goldman Sachs and signs that oil producers, especially Russia, were complying with the oil cut deal, according to market analysts being cited by Reuters. That was not enough to save most Loonie pairs, however. The euro had a mixed performance this week. Not only that, price action on the euro was rather choppy this week, with many pairs trading sideways for most of the week. These imply that forex traders had little interest in the euro and that opposing currency price action was dictating price action on euro pairs. That didn’t seem to have any impact on the euro’s price action, though. Anyhow, the other event was Monte dei Paschi’s confirmation that the ECB rejected the troubled bank’s request for an extension to raise the needed €5 billion in order to avoid getting wound down. However, that news also failed to garner a reaction from the euro. Like the euro, many Swissy pairs were also trading sideways for most of the week. The only top-tier event for the Swissy this was the SNB’s monetary policy decision. But as I noted in Thursday’s London session recap, the SNB opted to maintain its current monetary policy while complaining that the Swissy is “still significantly overvalued” and promising (or threatening) that it would “remain active in the foreign exchange market as necessary” in order to “make Swiss franc investments less attractive, thereby easing pressure on the currency.” Nothing new, really, so the Swissy barely budged. The Swissy did finish the week as a net winner, though, but that was arguably due to weakness on the part of the yen, the Kiwi, and the Aussie, as well as the Loonie’s quirky price action, rather than on any inherent demand for the Swissy. Heck, the Swissy barely even won out against the euro, another currency that was dormant for most of the week. Nice! The 42.5% who voted for the Greenback got it right. The 15% who voted for the pound and the 2,5% who voted for the Swissy would have also come out on top. That means that more than half of you probably did pretty well this week. 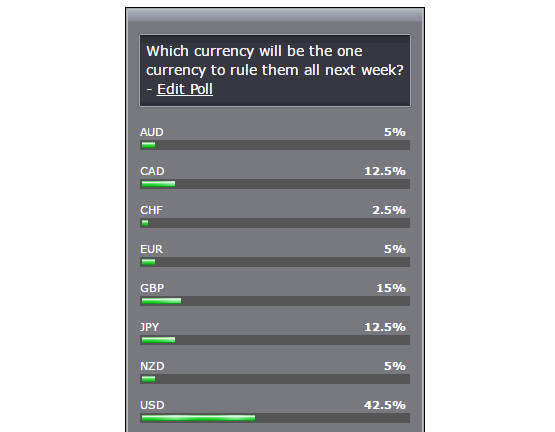 Unfortunately, 5% voted for the Kiwi, 12.5% voted for the yen, and another 5% voted for the Aussie. Hopefully you guys and gals were able to punch out with just a scratch. Okay, now that you know what the likely drivers were this week, and having taken a look at the forex calendar for next week, which currency do you think will come out on top next week? Vote in the poll below!